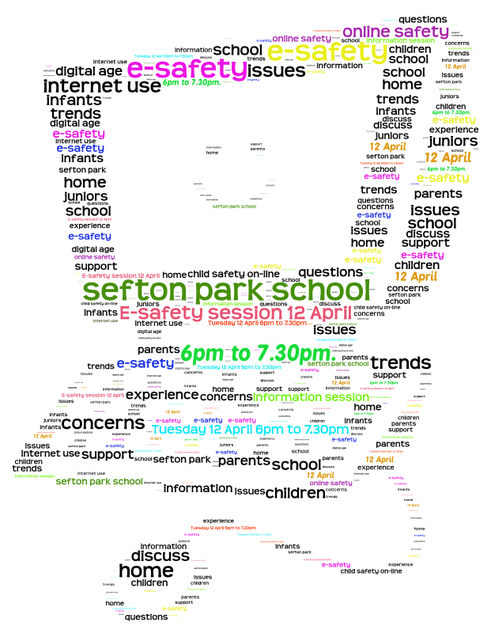 Alan Earl of SWGfL (South West Grid for Learning) and Avon & Somerset Constabulary, ran a really informative and insightful session on E-Safety for Sefton Park parents on 12 April. Alan delivered a really engaging presentation, with some clear pointers for parents about how to keep our children safe online. He began by saying that e-safety is about behaviour not technology; adults consume online content, whereas children collaborate, game, learn, strategise, communicate, and more. Alan asked, are you a digital immigrant or a digital native? Our children are growing up as digital natives, but many of us parents were born prior to the digital age, and consequently learn and behave online in a different way. Alan advised that the best tool available to parents is dialogue. He described how children don’t make a distinction between online and offline activity. As parents we need to know their world, and show an interest. It builds trust and means that our children will talk about it if there is a problem. There are a variety of filtering and monitoring tools available to parents, such as PEGI ratings for computer games, and console settings which can limit use to a certain amount of time. "Alan held his audience well and offered up some valuable tips and guidance", said Dan Simson, Deputy Head. "We take this subject seriously at Sefton Park and start to talk about e-awareness with our children at reception age. We use a comprehensive scheme of work that enables children to build up knowledge of themselves as a digital citizen (‘digizen’)."